As the end of the fiscal year approaches, many companies are faced with under spent budgets that need to be expended before the year ends in order to avoid budget cuts for the following year. With companies willing to spend, you need to be willing to sell! The added pressure of this necessity to spend, creates an excellent opportunity for B2Bers. Since things are rather slow this time of year in the B2B industry, many people take advantage of the downtime by going on vacation and whatnot. This isn’t going to be you though. While others are taking a pre-vacation before the holiday vacation, you are going to work. Since there will be less competition pitching to your desired prospects, you are at a complete advantage to start or further build on the foundation of these prospect relationships. While their current sellers are on vacation and ignore them for a few weeks, there you are actively seeking their business, giving them attention, listening to their needs. Even if they don’t purchase from you right now, they are aware that you exist and awareness is the first step in the marketing funnel. December is a time when a lot of key decisions for the upcoming year need to be made so this is an opportune time for you to get to get out there and sell. B2B buyers are reviewing this past year’s performance and are preparing a strategy on how to successfully increase next year’s performance. With their minds open to new ideas on how to further increase success, there is no better time for you to chime in with your pitch. All year you’ve been tirelessly working to accommodate your clients and prospects but what about you? Take this ‘off-season’ to get yourself organized. Review and analyze your performance throughout the year. This includes, but is not limited to, probably much needed website maintenance, fine-tuning your SEO, social media assessment, content analysis, marketing strategy adjustments and overall, evaluating your previous year’s goals and objectives and seeing how your efforts have or have not achieved those. When approaching your off-season, something to ask yourself would be why is this season, your off-season? Is it related to the industry you’re in, or is it something you can control? This also might be worth looking into. CGT Marketing has been building brands and helping companies grow since 1987. 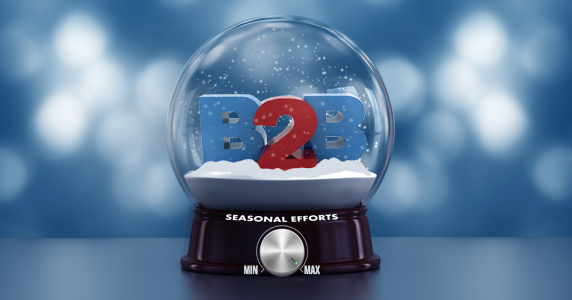 If you need help maximizing your B2B marketing during the holiday season, or any time of the year, contact us today!